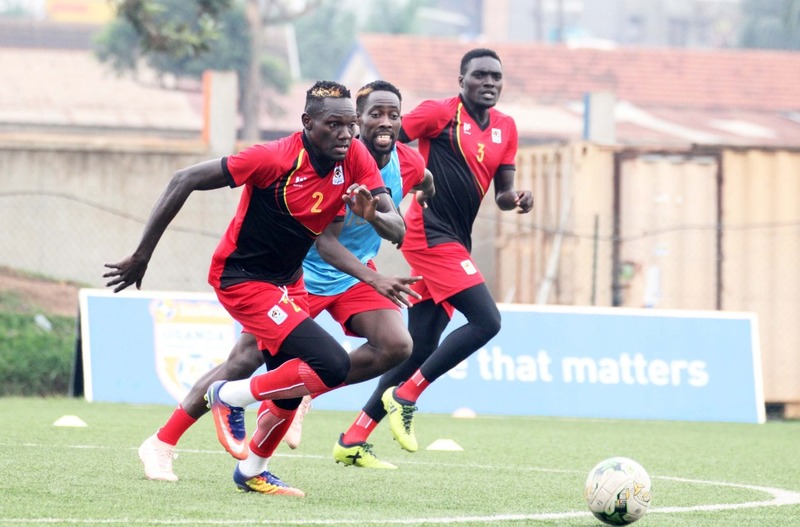 NAMBOOLE – More foreign players joined the third day of Uganda Cranes training ahead of Cape Verde Clash on Saturday. Geoffrey Walusimbi , Khalid Aucho and Edrisa Lubega are the three more players that attended training at Namboole as the Cranes gear up to Saturday’s crucial tie. Team Captain Denis Onyango and other players are expected to join the camp at Kabira country club effective tomorrow. Speaking to the press, Kaizer Chief’s left back Grocery Walusimbi mostly referred to as’ Jaja Wali’ said that the boys are positive and they are going to get the three points against Cape Verde come Saturday. “The boys are positive that they will defeat Cape Verde, so we are well prepared. Said Walusimbi. He also added that the the team is aiming for a win even though a draw is still good but their focus is on winning. “All we want is to win this match, a point is still good but we don’t want to draw from home. He added. Charles Lukwago (KCCA FC) and Nicholas Sebwato (Onduparaka FC), Isaac Isinde (Kirinya Jinja SS), Murushid Juuko (Simba SC), Timothy Awanyi (KCCA FC), Denis Iguma (Kazma FC), Nicholas Wadada (Azam FC), Godfrey Walusimbi (Kaizer Chiefs) FC, Joseph Ochaya (TP Mazembe), Hassan Wasswa (El Geish), Khalid Aucho(Church Hill Brothers, India), Ibrahim Saddam Juma (KCCA FC), Tadeo Lwanga (Vipers SC), Moses Waisswa (Vipers Sc), Allan Kyambadde (KCCA FC), Emma Okwi (Simba SC), Edrisa Lubega (SV Ried), and Patrick Kaddu (KCCA FC).